When we are playing Commedia dell’Arte we will run into a few problems. One is that one of the cornerstones in Commedia dell’Arte is the masks and that the audience is supposed to know them, which is not always the case today. Modern western audiences are seldom used to the play with masks and the energy and size that are demanded. We also must create room for the actors to improvise something that also creates problems that must be solved. These are the kind of problems we solve using the performance structure. 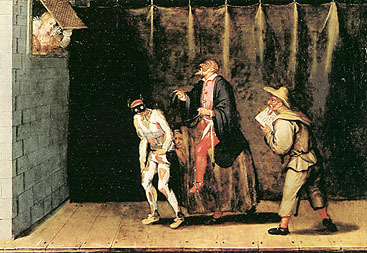 Commedia dell’Arte communicates to the greater part with images of people/masks, situations or desires, rather than the dialog. Therefore the masks are moving in more levels. We can divide the structure in Commedia dell’Arte in different elements that are recurring and recognizable. It is the same division as used when defining Vulgar Comedy, taken from Anthony Capoti. This structure is based on elements from popular festivities from the ancient world to the renaissance and it is still valid when we analyze Commedia dell’Arte and Vulgar Comedy. Also status play and hierarchic structures are important elements of the performance structure, as well as the element of parody. These are very old elements that even a modern audience will recognize instinctively. Not all of these components are found in every Commedia dell’Arte play, but there is always more the one or two. There is also hybrids and crossings of more the one element. One example is the Captiano’s bravura where both stupidity and frenzy are fundamental elements. When taking about performance structures we also must talk about the structures that are more of building blocks in Commedia dell’Arte. To do that we will talk about three reoccurring terms Scenario, Canovaccio and Lazzo, and also the Prologue.